There is no doubt that the Z-Ultimate China Tour 2016 is a martial artist’s dream vacation. The Wudang Five Immortal Temple – a thousand year-old Taoist temple in the Wudang Mountains, birthplace of Wudang Kung Fu and Tai Chi. The Purple Cloud Temple, the perfect balance of Yin and Yang, combining elements of metal, wood, water, fire and earth into a temple renowned for the level of energy you can literally feel in the air. The legendary Shaolin Temple is considered the birthplace of Shaolin Kung Fu, home to the Shaolin Warrior Monks and the most famous Zen Buddhist temple in all of China. We will also visit the second oldest Buddhist temple in China – the Fawang Temple – where many students come to live and train to become future Kung Fu masters. At roughly 24 million people, Shanghai is one of the largest cities in the world. With that many people – and in China, one of the oldest countries on Earth – you can imagine the variety of sights to see, museums, cultural landmarks, food markets, shopping, nightlife and more. 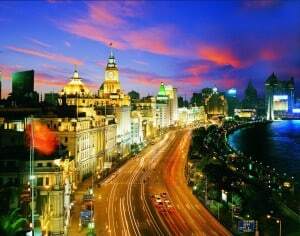 The Bund is a famous waterfront that evolved from a muddy embankment on the Huanpu River to the modern destination it is today. Starting in 1842, Western-style banks and trading houses were built upon the river, blending different architectural styles with traditional Chinese design. As Shanghai and The Bund grew through the 1920’s, 1930’s and into today, the colonial design became a part of the landscape. Some of these famous buildings include the former British Consulate, Customs House, the Waldorf Astoria Hotel (formerly the Shanghai Club), the former Hong Kong and Shanghai Banks and the Peace Hotel. With a combination of renovated colonial buildings from as far back as the 1800’s to the new promenade, underground walkway tunnels, 2,000 benches and stunning views of the Bund and the modern skyline of Pudong, touring the Bund on foot or via waterway is a moment you won’t forget. 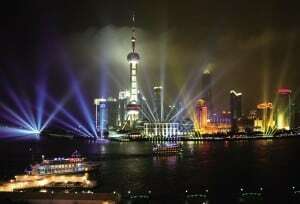 There is also the Oriental Pearl TV Tower – one of the tallest structures in China at a height of 1,535 feet – located on the Pudong District side of The Bund. At night, the Tower is illuminated with special LED lights in a light show visible for miles around. Also in Shanghai is the Shanghai Museum, holder of one of the best collection of Chinese historical artifacts in the world and the China Art Museum, the largest art museum in all of Asia. There is also the Shanghai Natural History Museum and the Shanghai Science and Technology Museum and many more smaller, specialized museums. If you like to shop, you won’t be disappointed in Shanghai. There are over 257 shopping malls, 138 flea and street markets, 74 specialty and gift shops, 23 art galleries and much more. Shanghai is just the first city we are visiting on the Z-Ultimate China Tour 2016 – we haven’t even talked about Beijing yet, which is our last stop on the tour. More on that in a future post, but for now, I hope we can agree that just the martial arts part of the tour is mind-blowing, not to mention the incredible experience and memories you are going to create upon visiting Shanghai, Beijing and the rest of the stops on the tour. When you combine the historical martial arts landmarks and training with visiting some of the largest, oldest and most vibrant cities in China, the China Tour 2016 quickly turns into a once-in-a-lifetime experience. If you are thinking about joining us on the China Tour, please FOLLOW THIS LINK or click the button below and register today. Our first round of 100 seats sold out almost immediately and our second round only has a few spaces left. You will also want to leave yourself plenty of time to make sure you have your passport and Visa arrangements taken care of. Don’t wait – please register today!